Teams must register online before it closes on Tuesday, September 18th at 5:00PM Central Time. Payments and athlete changes are available at The Race Village on Friday, September 21 5:30pm-7:30pm and race day morning after Open Events start. Checks can be mailed to Chile Pepper, Inc. Box 10734, Fayetteville, AR 72703. Please note this is a new PO Box in 2015. High School teams must be a member of NFHS. If your team does not meet this requirement please contact Jay Lewis. Use Team Registration Link on website with username/password. School may have more than 1 team; 2nd team requires additional username/password. 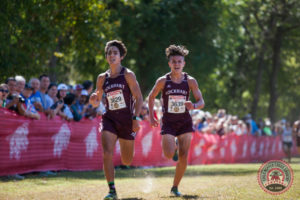 NO unattached runners; All athletes’ schools must have a cross country team. If a Team is not participating in the meet their coach may authorize a student athlete to attend with; a written note, prior arrangements with registration, under parental supervision and wear the team’s uniform. Cost is $250 each team up to 7 runners, then $35 each additional athlete. Use Team Registration Link on website with username/password. YES, It is an 8K for the College Men for 2018! College Women is a 5K. *Unattached runners must qualify for the college race. Men: 8K time of 29:00 min. or less this calendar year. Women: 5K time of 18:00 min. or less this calendar year.